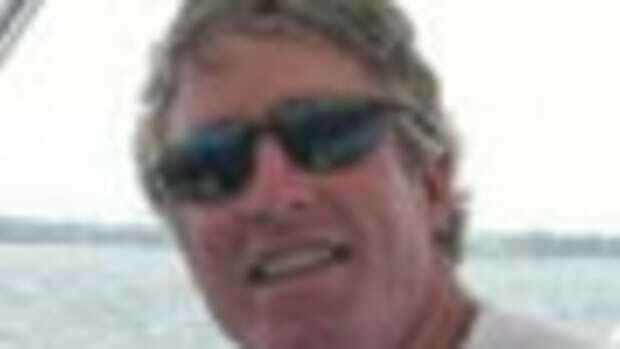 Chuck Hawley is a lifelong sailor and powerboater who grew up on the California coast. He has racked up 40,000 sailing miles on a variety of vessels - from ultralight "sleds" to single-handed sailboats to the maxi-catamaran PlayStation. During his 32 years at West Marine, Hawley, 55, has held a variety of positions, from vice president of stores and vice president of product development to his current role as vice president of product information. 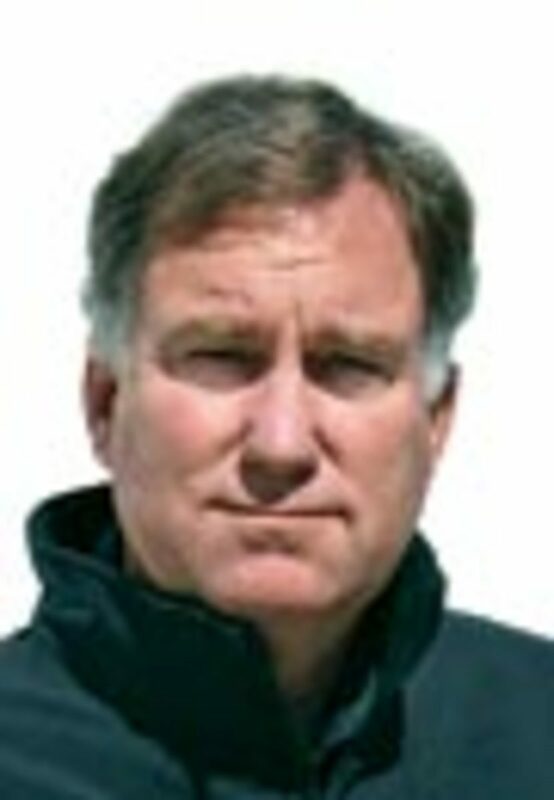 He has done extensive research into crew overboard recovery, life raft design, anchor design and storm tactics. 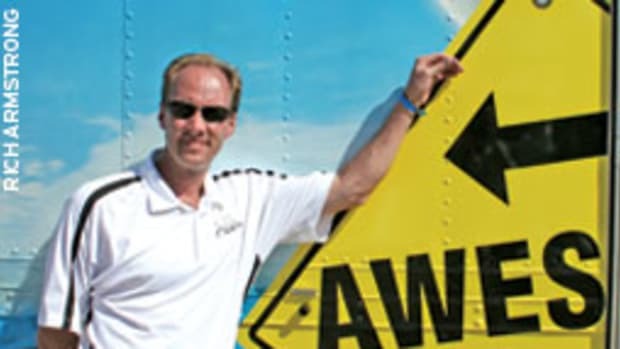 As a nationally known speaker on marine safety and one of five moderators of US Sailing&apos;s Safety at Sea Seminars, he understands the importance of functional, easily repaired electrical, water, engine and fuel systems. Hawley enjoys boating with his wife, Susan, and his five daughters. 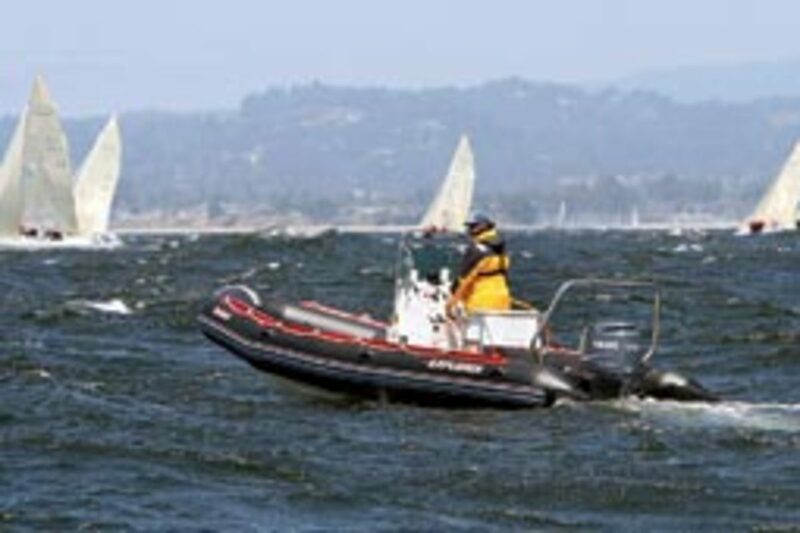 The family&apos;s 21-foot Zodiac RIB is used as a safety boat for regattas in Santa Cruz, Calif.
Q: You&apos;ve been with West Marine for more than 30 years. How did you join the company? A: Several of the company founders sailed out of Santa Cruz Harbor in the mid-70s, including founder Randy Repass and CEO Geoff Eisenberg. We spent virtually all of our non-working time either living aboard or racing. In late 1977, Randy asked me if I would be interested in interviewing at West Coast Ropes, as West Marine was then called. I started out doing some much-needed building maintenance on the Palo Alto store and then moved to the then-new Oakland store as a sales associate. Over the course of the last 30-plus years, I have worked in the stores, marketing, Port Supply, Internet and merchandising departments. Q: Have your various jobs involved product testing? 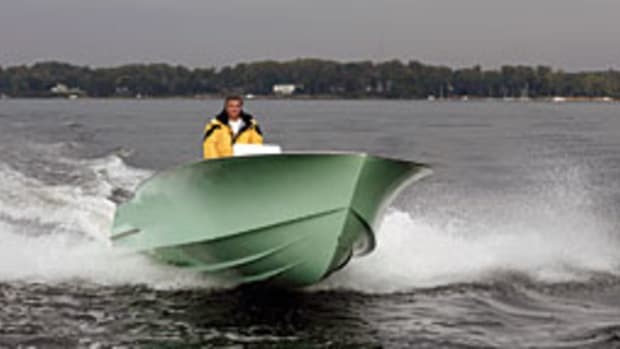 A: West Marine has believed in product testing going back to the founding of the company. For many years, virtually everyone in the company was an active boater, and our experiences with our own products helped us select - and reject - products. 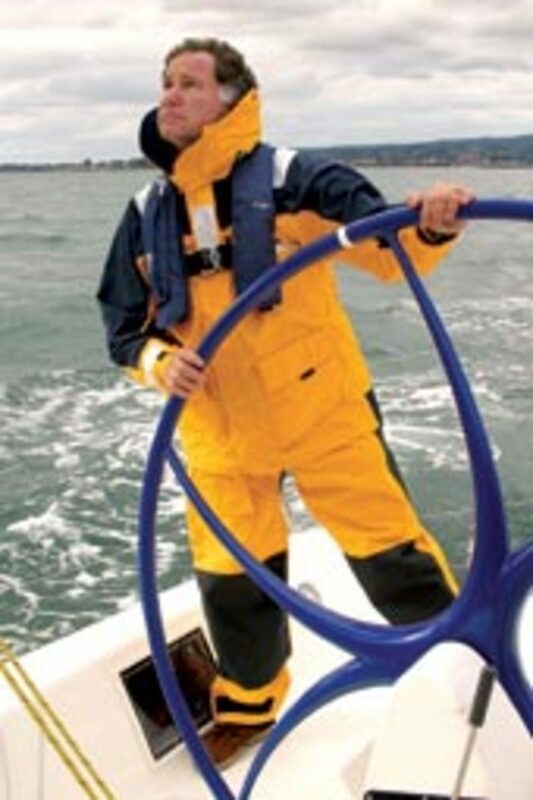 I remember the discomfort of showing up at a yacht club after a particularly rough race and facing a dozen infuriated sailors who had bought some "breathable" foul weather gear in the late &apos;70s. Breathable, yes, but also really leaky. 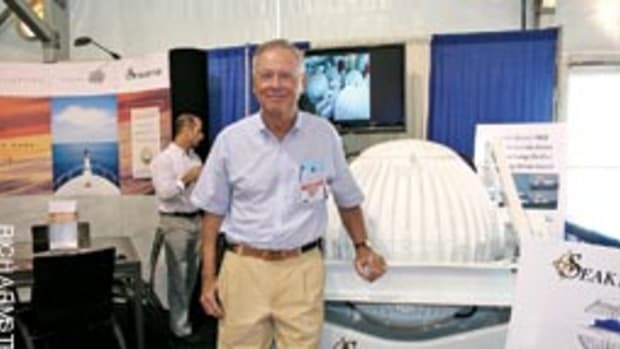 I was vice president of product development for about eight years ... so my job consisted of many disparate functions involving development, testing, sourcing, packaging and marketing items under the West Marine brand. The first "professional" test I recall was when Nav-X, manufacturer of the Fortress anchor, asked me to participate in a test on San Francisco Bay to demonstrate their anchor&apos;s ability to hold in soft mud. ... It was a fantastic experience to do repeated tests of anchors in the 45-pound range. I ended up writing up the test for the industry, and it&apos;s still available online. Q: What are some of the most important tests you&apos;ve done with regard to safety? A: In 1994 and 2005, we worked closely with a number of sailing schools and organizations to try to determine the best way to recover a person in the water from both sail- and powerboats, single-handed and crewed, upwind and downwind, and in various wind conditions. Over the course of the two tests, we performed hundreds of rescues, the results of which have helped shape how sailing schools around the country teach crew-overboard recovery. 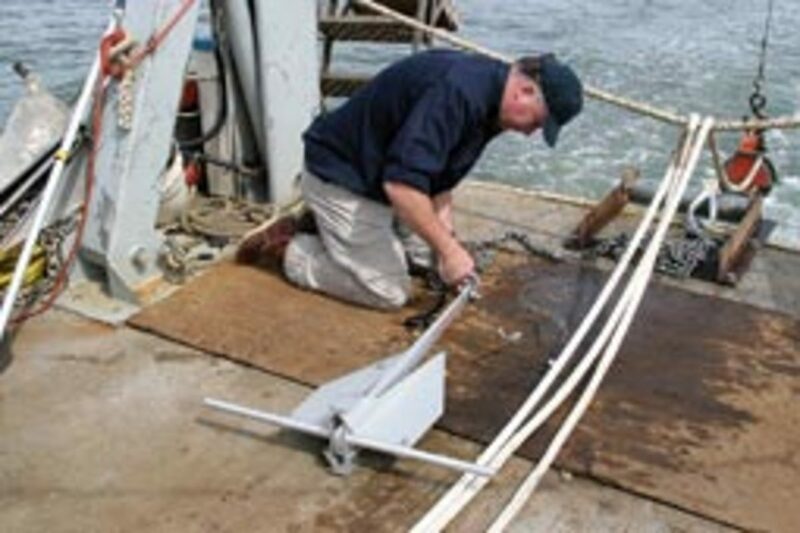 West Marine also sponsored two tests of GPS-enabled EPIRBs and PLBs, which were organized by Equipped to Survive Foundation. The results of these tests led to more stringent specifications for the GPS receivers on beacons. We found that the battery-conservation strategies of the beacons would occasionally prevent the GPS from acquiring a fix, and that the ability to get a fix in high-obscuration environments like forests varied between models. I like to think that the current generation of beacons is better due to what we learned from these tests. Finally, we recently conducted a test of personal strobes and lights to determine what we should recommend to offshore boaters. We took 16 different lights and loaded them on my Zodiac, and put several observers on shore. We tested the lights in random order at distances from 0.5 to 2 nautical miles and found that some of the LED products were equal to or better than the xenon strobe products. We also learned that we need to improve our technique, as the results were too inconsistent to feel comfortable about publishing the results. Q: Can you recall one of the more memorable tests you&apos;ve performed? A: During the second life raft test, I worked with an experienced sailor named Ray Thackery, who was involved in importing the Tinker dinghy/lifeboat from England. He was an advocate of lifeboats that could be sailed to shore, and I was more of an advocate of traditional stay-in-one-place rafts. We picked a very rough day to put our biases to the test outside the Golden Gate on Four Fathom Bank in about 25 knots of breeze. After hours of deploying, boarding, capsizing and reboarding the rafts, we decided to sail the Tinker into San Francisco Bay. We stepped the mast, bent on the tiny jib and sailed under the Golden Gate Bridge and into Gas House Cove. I have a picture of an enormous container ship sailing past us as we made our way to "safety." Q: Outside of the Coast Guard-mandated equipment, what are the top three safety devices or pieces of equipment that boaters should carry on their vessels? A: The Coast Guard-mandated equipment list is focused on smaller boats operating in relatively benign conditions. I realize that they prescribe equipment for boats up to 65 feet, but they omit obvious proven lifesaving items like a VHF radio and an anchor and rode. However, the Coast Guard and state boating agencies are quick to recommend a list of gear in addition to the general minimums. If I were forced to limit my choices to just three items, they would be a fixed-mount VHF radio with the correct antenna for the vessel, a Life-sling for crew overboard recovery, and a PLB or EPIRB for those times when you&apos;re in deep yogurt. Q: Is there an overlooked or underrated piece of safety equipment out there? A: Let me fudge a little bit and give you a short list of highly effective items that sometimes get inadequate attention. You have to start with anything that prevents drowning, since drowning is the cause of death in 70 percent of boating fatalities. A comfortable Type III vest that you&apos;ll wear every time you&apos;re on the water or an inflatable vest is the answer. I know there are conditions where a Type III is "over its head," but most drownings happen surprisingly quickly, so you have to have a vest that you&apos;ll wear. ... Three more items that are cheap and effective: a waterproof hand-held VHF radio, a PLB and a signaling mirror. Q: Based on usefulness and value, what are the top five safety products West Marine offers for around $100 or less? A: Standard Horizon HX280S hand-held VHF, Lifesling2, Greatland Rescue Laser Flare, West Marine Action Reflex Life Vest, and 70-foot throw rope bag. Q: So-called "green" products have been gaining popularity in recent years. What are some of the successful green products that West carries? A: West Marine has carried environmentally preferable products for over a decade, but ... our emphasis in the last two years has been with products that are directly discharged into the environment, like cleaners and products with high VOCs [volatile organic compounds]. We&apos;ve changed the formulation of many soaps and cleaners to use less hazardous surfactants, for example. Many of our maintenance products that traditionally have had a petroleum base are now made with natural oils. The product I am most excited about for 2010 is our Pure Oceans TC-W3 [2-stroke] engine oil. This is an ester-based base oil product that is completely biodegradable, fully synthetic, has low toxicity, and it exceeds TC-W3 standards. There are tens of thousands of 2-stroke engines in use every day that can benefit from the performance of this oil while reducing the pollution that is caused by older-technology engines. Q: You have an extensive sailing background. How did you get started? A: After working for West Marine for a few years, I bought a bright yellow Moore 24 in 1979. This design was relatively unknown outside of Santa Cruz. It was faster than many 32- to 35-foot boats. 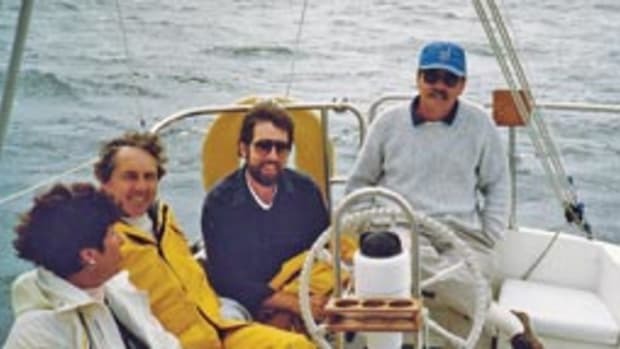 I began racing it on San Francisco Bay with the fledgling Singlehanded Sailing Society, and I became hooked. I remember races to Drake&apos;s Bay, Southeast Farallon Island and eventually to Hanalei Bay, Kauai, Hawaii. I was terrified about 25 percent of the time, but the exhilaration of surfing under a spinnaker, of making a landfall, and of doing well in a race - that pushes the moments of pure terror into the back of one&apos;s memory. 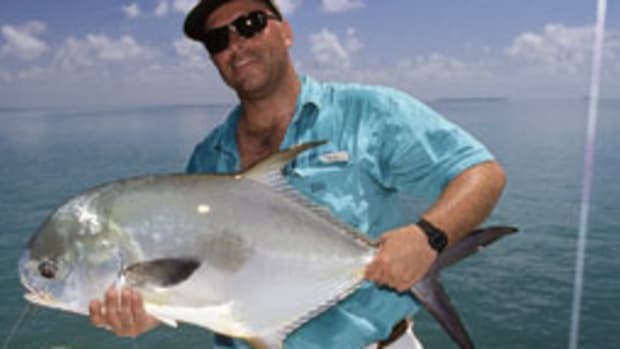 A: I did have an interesting encounter in mid-Pacific on the Singlehanded TransPac in 1980. I had stumbled into the Pacific High, along with many other boats in the fleet, and it was stacking up to being a very slow race. One morning, on the horizon, I made out a small boat that I was slowly overtaking. It was being sailed by Amy Boyer, who was becoming well known as a young single-handed sailor. She was also gorgeous. By about 0900, I had sailed alongside her, and we were chatting about the fact that it was her 21st birthday, and here we were, 1,000 miles offshore and bored. 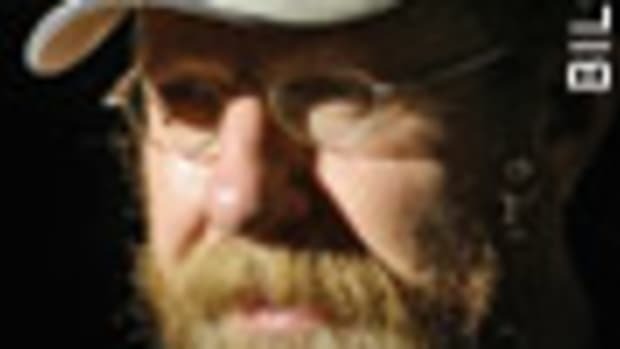 I ducked under the tiller to sit on the leeward side of the cockpit, whereupon the tiller autopilot flipped up in the air and over the side. There was a short moment when it was towed behind me by its power cord until the power connection parted, and it drifted astern. Amy deftly maneuvered her Wilderness 21 to where she could pick up the autopilot, and handed it back to me. Whatever thoughts I had of helping Amy celebrate her birthday were quickly replaced by the thought of hand-steering a 2,000-pound boat the remaining 1,000 miles to Kauai. Thankfully, I was able to disassemble the autopilot, rinse it out with fresh water, and somehow get it to work for the next seven days. I have always thought of this as an opportunity missed, however. Q: What are some of the boats you&apos;ve owned through the years? A: 14-foot Hobie cat - This is probably the boat that hooked me on sailing for life. The ability to go so fast, powered only by the wind, and to be in control of your own craft was intoxicating. Moore 24 - Made me a better sailor by rewarding good steering, good sail selection, and carried me safely across the Pacific. 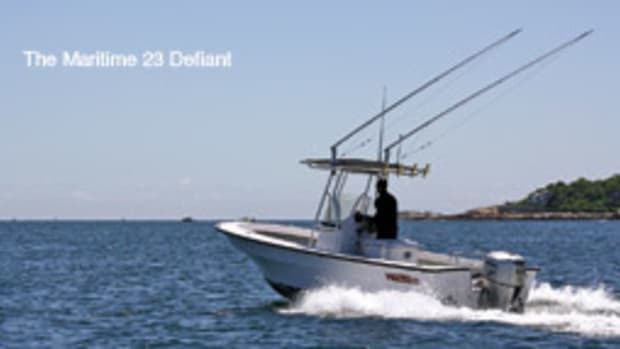 Olson 30 - Another single-handed boat that proved seaworthy in everything from calm to Force 8. 21-foot Viper 640 - Ever since I first saw the Viper at Sail Expo in Atlantic City, N.J., I knew I had to own one. I think it is the prettiest, best-sailing daysailer ever, but it&apos;s a bit of a handful in Santa Cruz and with my kids. I turtled it in about 20 knots with my brother and another great sailor, and we were sort of mulling over what the headlines would read if we didn&apos;t get it righted. "Supposed boating safety expert lost due to bad seamanship" was enough motivation for us to return to the harbor soon thereafter. 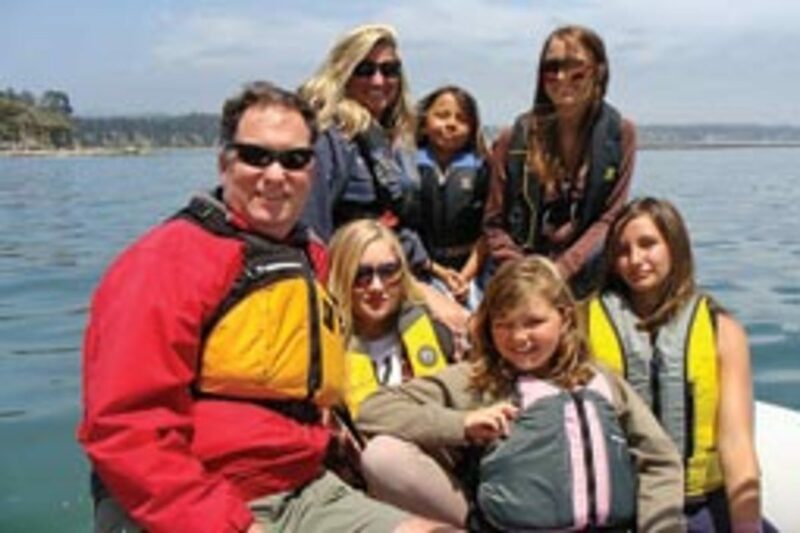 21-foot Zodiac ProOpen 650 - This RIB has allowed me to take my daughters out on Monterey Bay and show them how cool the local marine environment is. We&apos;re blessed in Santa Cruz with sea otters, sea lions, seals, porpoises and dolphins, migrating whales, pelicans, sooty shearwaters, giant brown kelp and so much more. 14-foot Megabyte - This was sort of a midlife-crisis purchase, and I am so glad that I did. The Megabyte is a perfect way to connect with the nuances of sailing. It requires a sensitive hand on the tiller, good abdominal strength - working on that! - and I can enjoy it with my daughters. Q: Are you planning for any future sailing adventures, races or cruises? A: Right now I am happy teaching junior sailors how to sail their El Toros on weekends. It&apos;s vital that those of us in the marine industry do what we can to attract new sailors and powerboaters, and I am having a great time trying to explain to kids how to get out of irons and how to sail fast around a race course. I am also doing some on-the-water powerboat instruction using the excellent US Sailing curriculum through Santa Cruz Yacht Club.